While finishing the test in real fabrics a lot of things had to be considered. Is this gonna work? But first things first. 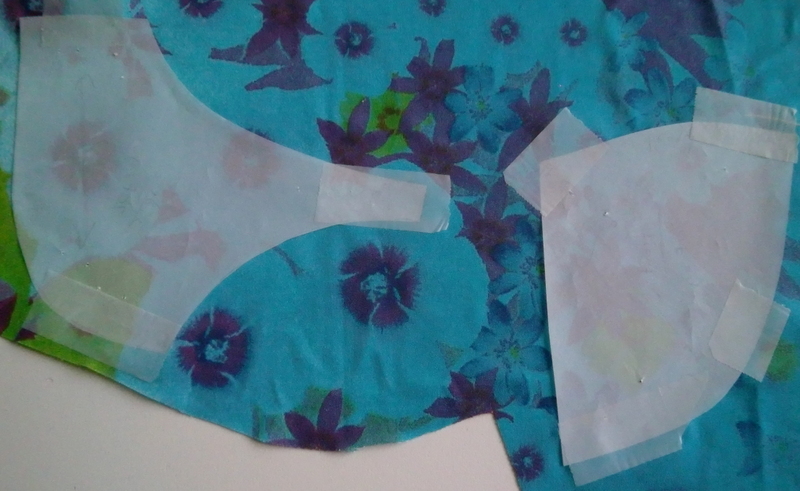 For one of the cups in this test I used a fabric almost impossible to get the pattern pinned on. It’s kind of sticky somehow and pins just won’t get through. I use a simple trick for those fabrics and for very delicate one like silk as well. Instead of pins use tape to stick it on the fabric. Preferably clear temporarely tape, it’s the type you can write on as well. You have to cut one layer at a time though because of course it won’t hold 2 layers together. The 2 cups were cut in a different version to try all the ideas at the dame time. That’s what testing is for isn’t it? One cup in fabric with the power bar and front strap in scalloped lace and the other cup just the other way around. For both cups I used padding inside the power bar to see how this would work. Already during cutting it became clear it was no use cutting the cup in scalloped lace. The scallops will only show up in the front part and it’s kind of silly to do so when the rest doesn’t have the scallops. The results made clear that using padding in the plain power bar was not so nice, it’s sticking out a bit while the one with the scalloped lace stays flat. That’s because the lace has to be sewn on top of the padding, making it flat. For the plain power bar a blind seam should be used because sewing through the fabric would look terrible. And a blind seam tends to stick out … So that’s one deceision made, for a plain power bar at the outside no padding should be used. Once the cups were in the good old fitting band more problems came up. The front strap was pushing the top edge of the cups aside. The strap itself worked very well, covering the mid front of the breast and shaping it neatly. But the top edge of the cup itself was too loose with the front strap pushing it where it should not be. With every movement the problem got more obvious. The loose straps would have to go. Luckily there was some good news too, the lace power bar at the outside seems a good idea. Too me at least. I think it looks quite pretty at the outside this way and makes the cup look smaller. Which is a good thing when you have a deeper cup like a G or a F or even an E.
The bad news though; the cup itself is not supportive at all this way. I had made a nice curve in the top edge too get some bare skin peeping out between the strap and the top edge of the cup. For such a deep plunge this is not working well without the straps giving extra support. Curvy top edges only work well in bras that are higher up at the front. Of course I can find a way to fix this but is it worth it, considering the high level of sewing needed to make this bra? All these problems together are making it less painfull to leave this design and move on to another less complicated one. 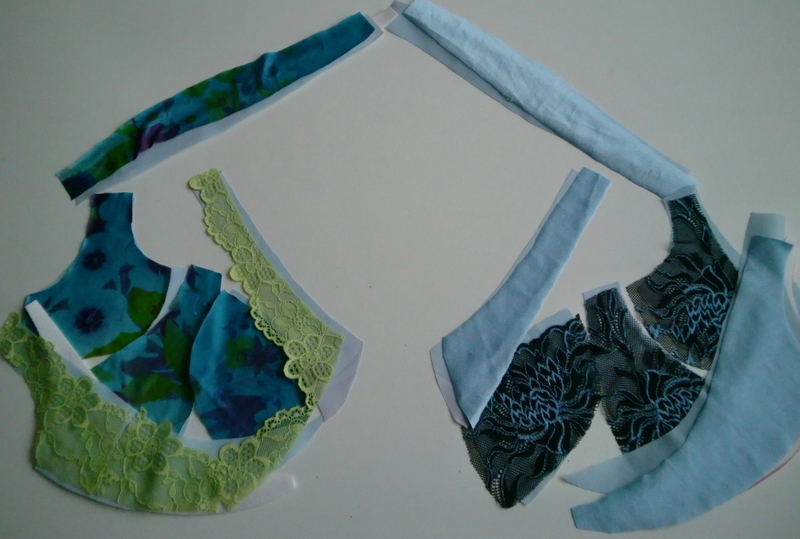 This entry was posted in E-F-G pattern development and tagged adjusting, bra band, bra cup, bra pattern, comparing, cutting, design, developing, DIY, fabric cutting, fitting band, lace, lingerie, lycra, picture, plunge bra, scallops, sewing, straps, support, underwear. Bookmark the permalink.